Eating disorders are very serious. No matter what the particular eating disorder is, it can get to a point where it can affect your life. Binge eating disorder is no different. But, what is binge eating disorder? For some of us, binge eating might be something you have partaken in from time to time. Like when you get a cheat day on your diet and you go off the rails on Krispy Kreme doughnuts, but for some people, it’s a serious disorder. At what point do you go from cheat day overeating to a disorder that can threaten your health? This article will discuss what causes binge eating disorder, what are the symptoms of binge eating disorder, and binge eating disorder treatment. We also have suggestions for additions to a binge eating disorder diet plan that may be able to help you if binge eating disorder is a problem in your life. There are many factors that go into the causes of binge eating disorder. The main factors can usually be broken down into the following categories. In an interesting turn that science is investigating, if you have or had an immediate family member (parents or siblings) with an eating disorder, you are more likely to develop an eating disorder of your own. There is debate whether this is due a genetic component or if it’s due to a psychological reason, or both. Many sufferers of binge eating disorder tend to have psychological reasons behind it. It may be due to a coping mechanism for a variety of mental health issues, like stress and poor body image. Binge eating disorder can also become a part of dieting as a reward for dieting, or it may be triggered due to the restriction of calories. Binge eating disorders can occur at any age, but it most commonly starts in sufferers in their 20s. There is some evidence to support that there are some biological causes in some people for their eating disorders including binge eating disorder. For example, some issues with the hypothalamus can cause your brain to think it needs more food or that it thinks the body is being starved when you have eaten food. The symptoms of binge eating disorder can be a little tricky to recognize because they can be similar symptoms to other issues. The symptoms of binge eating disorder can, for the most part, are divided into two categories, behavioral and emotional. One of the differences between binge eating disorder and other eating disorders is that with other eating disorders, there will be an urge to compensate for the overeating. Those with bulimia, for example, will binge eat and then purge the extra calories through excessive defecating (via laxatives), vomiting, and overexercising. Binge eaters will just binge eat. Now, we’ve all overeaten at one point or another. Maybe you went out for all you can eat sushi, and you literally ate all that you could. 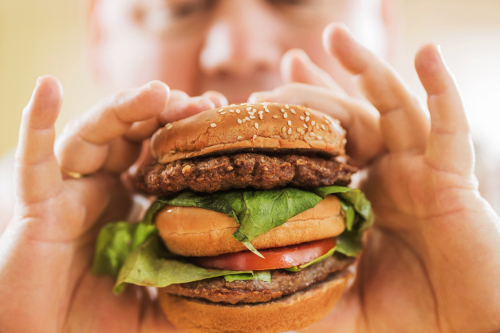 What is the difference between overeating and binge eating disorder? Overeating can be a one-time thing, or it can be a constant thing where you just overeat. It may be a case of poor portion control. Binge eating disorder usually has a psychological issue as a component and as a drive. In many ways, you have no choice when binge eating, and after you’re done, you may feel guilt and shame, and may go to efforts to hide your problem. Luckily, there is help. There are a few things you can do to treat your binge eating disorder. Like many problems, it is best if you treat the root issue. In this case, therapy to deal with the mental health issues that are causing your binge eating. While not fool-proof, this may help stop your binge eating completely. There are also some diet steps that you can take to help stop your binge eating as well. The biggest is to simplify your diet. If you feel you have an eating disorder like binge eating disorder, start paying attention to your food habits, behavior, and emotional state during these binges, as well as how often you are binging. If you feel you might be falling into a binge eating disorder, see a doctor to find the right professional help for you. Shanks, N., “How To Stop Binge Eating,” Bodybuilding, February 9, 2017; https://www.bodybuilding.com/fun/how-to-stop-binge-eating.html, last accessed June 1, 2017.